We have a variety of console games with accessories. We call it Game Zone. We set up screens, speakers and the game system. 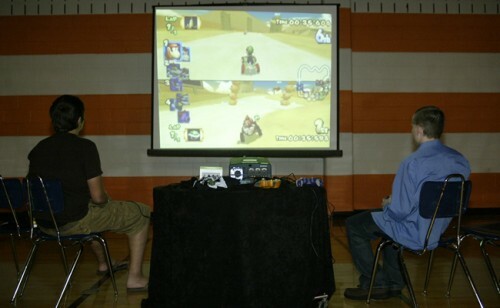 We can also provide mounted screens so that crowds can watch as you play. If you are a serious gamer, then the Game Zone is perfect for you. You and your party guests can compete at the game of your choice. Your choices of game systems are: Nintendo Wii, Xbox 360 and Playstation 3. Or you can choose all 3. You pick the games. We bring the whole system including 42″ plasma screens mounted on stands, speakers and even extra screens mounted on our truss so your guests can easily watch the action. 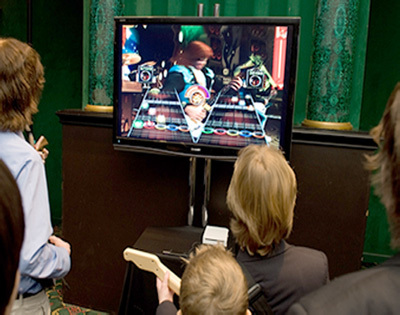 The Game Zone is always a hit with teenagers, especially with games like Guitar Hero and many of the interactive Wii games. And the best part is that beginners can have as much fun as those that are already skilled. The Game Zone is guaranteed to get people engaged in the game. Contact us by filling out our Request a Quote form to bring the excitement of the Game Zone to your next party or event!